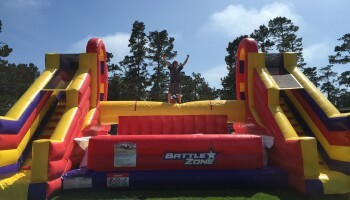 Enjoy our new inflatable called the Battle Zone! This is a great battle of the ages inflatable where two competitors climb up their own inflatable stairway and then walk the plank to do epic battle 8 feet up in the air with our jousting poles. The last person standing is the winner. If you happened to get knocked off the inflatable plank you will fall into a inflatable stunt bag style zero shock mattress (safety is our main concern). This brings jousting to the next level. The battle is a great view from down below where you will have your party attendees taking pictures and videos and it may even go viral. 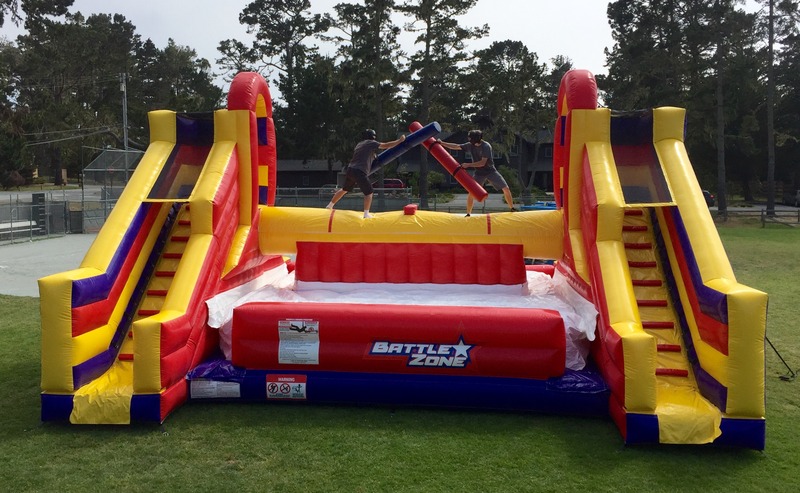 The inflatable battle zone is a take of the old show of battle of the network stars which was a huge hit in the 80’s. 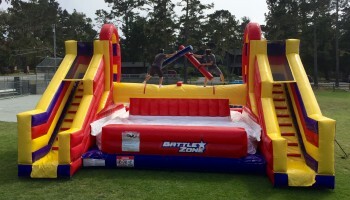 The Inflatable Battle Zone is a Jousting arena on Steroids. 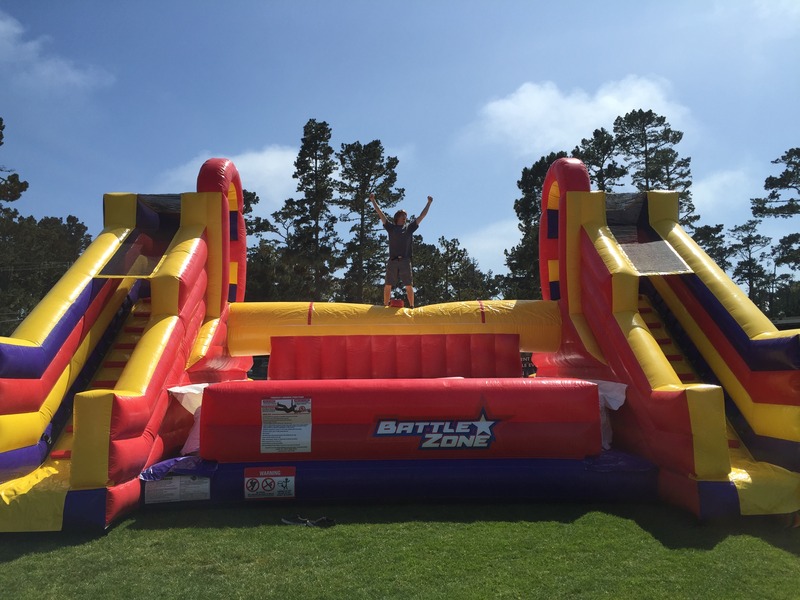 Ask us about having the inflatable battle zone tournament for your company event. This fun new game features a series of four inflatable red balls which challengers must jump across to reach the other side. This fast pace inflatable game is perfect for your next company outing and is a perfect team building ice breaker. 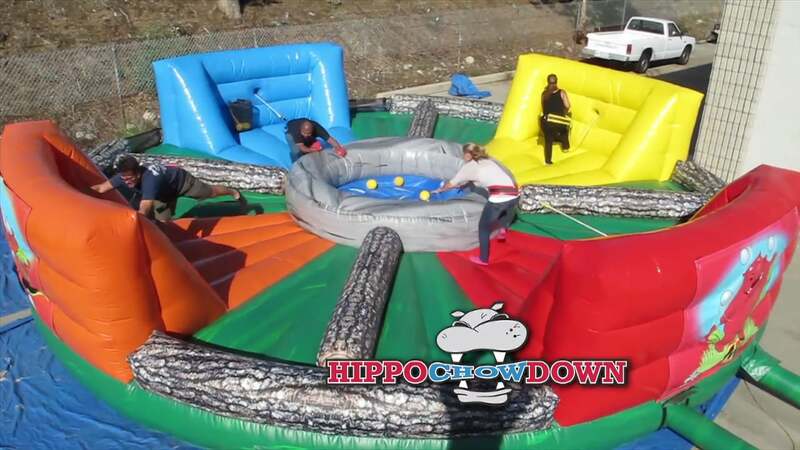 The object of the Inflatable Hungry Hippo Chow Down Game is 4 players are attached to bungee harnesses trying to grab balls that are in the center of the game and put them in their bag. Rentals for Our Inflatable Vortex Competition Game will keep your guests spinning around for more. Participants start out running around the Inflatable Vortex Competition Game trying to tag there colored buttons.